Aside from the delicious Slurpees which they are widely known for all over the world, 7-Eleven is notorious with their loyalty program called CliQQ where people can earn points for every purchase and get rewards for every set number of points. 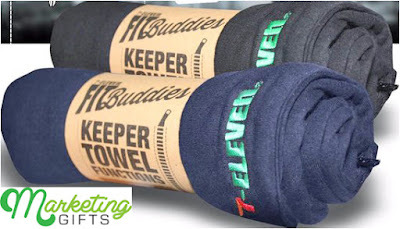 In their freshest promo, consumers will be more motivated to keeping themselves fit as soon as they receive this free Keeper Towel that can do more than just dry you off after your exercise. Made of High-Quality Fabric. Rewards that come from 7-Eleven are always made of high-quality materials, and this promotional towel is not an exception, considering it is created from thick but soft fabric. Consumers will fall for it, no doubt. Bigger Usage. This gift with purchase is called a Keeper Towel due to the fact that beyond its zipper is a compartment where people can store their water bottle, mobile phone, wallet or, if you pack nicely, even a change of clothes. This means that you basically do not need to bring a bag – this towel will suffice. More Brand Visibility. As it’s evident on the image above, the brand name of 7-Eleven is unmistakable on the zipped part of the free towel. It’s not that they lack of it, but this marketing product brings more visibility to the brand. Make your brand even more visible to your target group once you have analyzed the marketing ideas in our blog. If that’s not enough, do not hesitate to contact us at Marketing Gifts.